G’day! A very warm welcome to Border Park Organics. Click the icons to navigate through the five steps. Want to get shopping? Head to the shop now! Tip: you save on freight costs when others in your area order at the same time! Want to get going? Head to our interactive map now! Want to get started? Create your account today! Your meat will be ready to collect within 2-3 weeks of ordering. Where will you get this information? At Checkout (and via email notification), we’ll give you all you need to know. Any freight savings (by sharing a collection point with others) will be credited on your final invoice. If you have any questions, drop us a line. We’d love to help. As farmers, we’re humbled to have you here. If you’re keen to learn more about the benefits of organic food (particularly meat) and support our farming family by purchasing meat from us, then you’re in the right place! Over the past few years we’ve seen an increased global trend toward better health, particularly focused on real food. (And perhaps like you, our family hasn’t always put real food as a priority in our budget). Even though it’s becoming more popular, we’re also conscious of the common misconception that organic food is expensive and not worth the extra money. It doesn’t have to be this way (and we oughta know cos we’ve got a bunch of kids!). It’s also our desire to make organic meat accessible to other families. Can we suggest three things? Step One: Get to Know Your Farmer! If you’re curious to know more about our farming family, then check out our About page. You can read our story about how we came to Border Park, and why we’re so passionate about eating healthy food! Want to know how we organically manage our animals for optimum health and keep weeds under control (all without the usual arsenal of synthetic chemicals)? 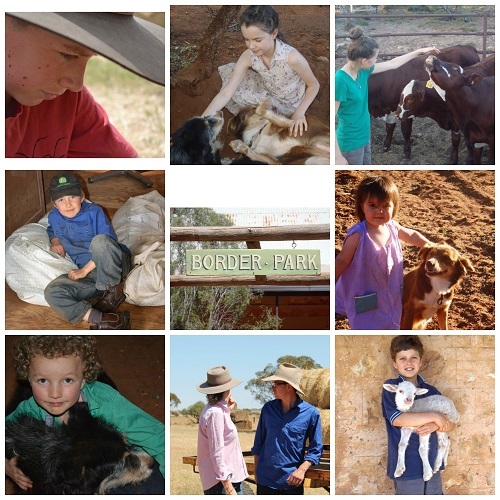 Keen to know how we’re training our next generation of farmers (aka our kids)? We send out monthly updates through our Border Blog newsletter. Here you’ll receive farming updates as well as simple, tasty recipes and exclusive offers. Join over 300 subscribers and get a peek into life on our organic farm. Subscribe to our newsletter today! Then, in the vein of farming community tradition, join us for a cuppa (or drop us a note if distance is an issue!) and introduce yourself. We’d love to ‘meet’ you. Alternatively, why not check out our delicious recipes. Hint: They’re probably a lot quicker and cheaper to make than you might think! Why not ‘pin’ a recipe that grabs your eye so you can make it soon? And if you haven’t already, why not sign up to our FREE monthly info blog called Meaty Morsels where you’ll get simple tips to help you prepare and cook your meat in the best way possible. Residents of South Australia, Mildura and Broken Hill have the opportunity to order monthly. We deliver to over 60 central collection points throughout South Australia, as well as Mildura and Broken Hill. For families, the health-conscious, those with allergies or special eating regimes, those who enjoy great tasting meat with flavours from the ‘good old days’. So you can be confident that the meat you’re serving your family and friends is certified organic and 100% pasture-fed. Our meat is also free of chemicals, hormones and antibiotics. Order your organic meat pack online and pick up your box of wholesome goodness from a collection point near you! With so many buzz terms around these days, it’s understandable if you’re a little bamboozled. We thought it might be helpful to briefly outline our understanding on the terms you’ll find on our website. For The Standard referred to through the definitions below, please see here. Hormonal products that act as growth promotants which help accelerate weight gain in livestock. While they are banned in the EU, approximately 40% of cattle raised for the Australian domestic market are still raised using hormone supplements. Synthetic medicines used to address disease in intensively farmed livestock, provide a growth boost, and suppress digestive biota in grain-fed animals. The actual weight of the meat product. All our meat packs and products are charged by the boxed weight (not carcase weight). An operation that is registered with a certifying body as complying to ‘The Standard’ for organic production. ‘Chemical free’ is used loosely by the organic industry to mean free of harmful chemical inputs. These may include but are not limited to pesticides, herbicides, insecticides and some naturally occurring chemicals, as defined by ‘The Standard’. Ultimately, ‘The Standard’ determines what we are allowed to use in our organic livestock and cropping enterprises. When we use the term ‘chemical’, we’re referring to these proprietary (owned) products that are classed under ‘The Standard’ as being not acceptable for use in certified organic food production systems. We realise that technically speaking, everything physical consists of chemical elements. For example: salt and arsenic both consist of naturally occurring elements. But arsenic is prohibited under ‘The Standard’ for food production for obvious reasons. The place where customers pick up their order. This could be either a location that is able to store orders for a short time, or an arranged location for an on-the-go pickup. A deposit of 50% of the anticipated order amount is due at the time of ordering. This will be calculated from the exact weight of an order, minus the deposit. It is due after the order is received. Livestock production where animals are not intensively confined. Rather they are allowed to graze in an open space, with access to pasture, water, shelter belts, sunshine and others in the mob. Refers to intensive feed-lotting of livestock. Animals are usually raised on pastures, then spend up to 3 months in a pen on a growth ration that includes a high percentage of grain. This is a broad term that refers to livestock that are allowed access to grass or pasture for feed, including natural and stubble pastures (and naturally occurring plant seeds), grasses, shrubs and hay. Generally all livestock will have access to grass during their lives, but perhaps not exclusively unless stated. Genetically Modified Organisms are the result of a laboratory process where genes from the DNA of one species are extracted and artificially inserted into the genes of an unrelated plant or animal. ‘The Standard’ does not allow any GMO-derived products in organic production systems. An older lamb that is approximately 13 – 24 months of age, and whose meat has a great flavour! A sheep that is at least 3 years of age and has a full flavoured meat. Stands for National Association for Sustainable Agriculture, Australia. The oldest of the 7 organic certifying bodies in Australia. The internal hard fat from beef or lamb found around the kidneys and loins. Suet can be used for culinary, beauty and general purposes. A production system that has an emphasis on building up and regenerating it’s nutrient sources and ecosystem to ensure long-term use by future generations. We refer to the National Standard for Organic and Bio-Dynamic Produce (edition 3.7) as ‘The Standard’. As organic producers, we are required to adhere to the guidelines within this document. Having verifiable records to demonstrate compliance with ‘The Standard’. For example, livestock records may show details such as birth date, parents, paddock movements, weights, changes to feed sources, any treatments and transport. To provide families with affordable and nutritious food. Food that promotes overall health and healing. Organically produced meat online. 100% pasture-fed. Grown with integrity and sustainably managed. Naturally free from chemicals, hormones and antibiotics. We believe everyone should be able to afford good food. We provide bulk meat packs, and also encourage you to try our great value secondary cuts and older aged animals. Using the whole animal, including lesser known cuts, provides nutrient-dense food, promotes creativity and avoids waste. We welcome questions and comments about our farming systems. Our production system and ‘paddock to plate’ processes are approved by independent auditing bodies, so you can be confident each animal’s ‘traceability’. Maintaining soil health is vital in our fragile Mallee region in South Australia. We’re continually working to find ways to regenerate our soils and native plants so this area can be farmed by generations to come. • being wise caretakers of our livestock and soils.